It is all about connecting the dots to create a whole. Over the last 5 years there has been an explosion of “Solutions” that promise improved patient engagement, improved reliability or improved efficiencies in General Practice. All these outcomes are essential for the long-term viability of General Practice but what has resulted is an absolute Spaghetti Bowl of solutions that do not interconnect, are not complementary and are limited. This has lead to having to deal with many providers on many plans that potentially leaves the Practice Manager wondering whom to talk to when there is an issue. Its like having a series of 4 lane highways that are interrupted with country lanes. The patient journey begins with the thought “I need to see a doctor today “. The patient needs access via the practice website, a mobile app or via the phone to create an appointment that is appropriate. Too often the only options available are “standard “and “long” appointment types. The available options need to cover ALL types, e.g. an Implanon insertion with Dr “X” on Thursday afternoon, a care plan review with a nurse, or a skin lesion removal with Dr “Y” accompanied by a practice nurse, with a procedure fee, and or the cosmetic procedure that requires a $200 deposit. If your appointment system does not cater for this detail it only partially addresses the patient and the practice needs. 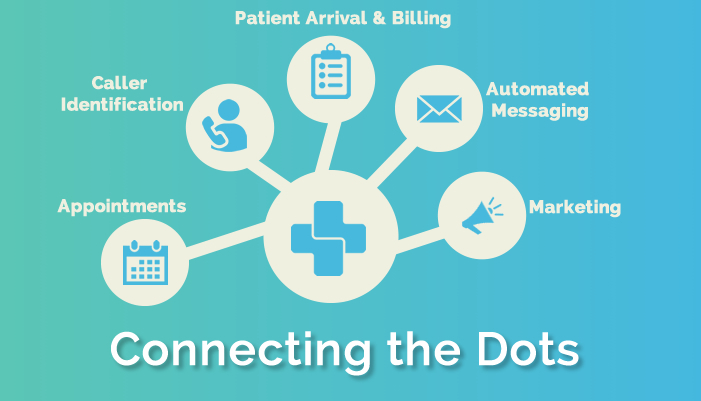 AutoMed Solutions provides these options with unlimited appointment types and also provides a phone ID solution that identifies the patient in the data base allowing the reception to immediately identify the caller. A totally integrated appointment pathway. Continuing the journey, the patient then needs to be arrived efficiently, (AutoMed arrives a patient in 5 sec) but as well as arriving, a patient’s data needs to be verified; are there any outstanding accounts, does the patient have an HCC card, has Medicare expired, is the patient late etc. All the functions that a receptionist does need to be addressed to ensure efficiency and reliability. If they are not, all you have is another partial “solution”. Once seen, the patient needs to be able to pay efficiently, via a kiosk or at the desk with an Immediate Medicare rebate directly into their bank account. The ANZ Health Pay solution provided by AutoMed Systems does just that. Automed has the ONLY Medicare integrated and authorised Kiosk payment system in Australia. A complete payment solution should include online payment solutions for repeat scripts or collecting a deposit for expensive procedures such as Cosmetic or Travel, allowing patients to pay online whilst requesting the service. Automed Solutions does just that. The text message services for recalls, results, appointment reminders, marketing and patient education needs must support unlimited character length and multiple languages, all at one fixed cost. Text messages are such an essential and powerful medium that there should be no limit to the number sent out. The messages then need to be recorded in the notes and need to be automatically followed up if patients do not initially respond. Looking forward patients need to access their GP via telehealth and the practice needs an appropriate and efficient payment system. The only Reception management solution that provides ALL these functions is AutoMed Systems. A programme created by a GP for GPs in Australia.